So, the nights are drawing in, there’s a chill in the air, and the leaves have dropped and are brown underfoot. Autumn has officially arrived, and this season has given rise to a change in fashion, a change in taste, and a change in what I find enjoyable. Like spring, autumn is one of those transitional times of years where you can certainly feel a change in the air. Halloween is fast approaching, I’ve already seen the first Christmas advert, and I find myself steering away from the kimonos and maxi dresses of this past few months, and back into thick tights and warm outerwear. So I thought I’d give you a quick overview of my autumnal favourites. How excellent are capes?! With the wind getting cooler, and a definite touch of frost nipping at my arms as I walk to work, I’ve found myself dragging my cape over my shoulders. 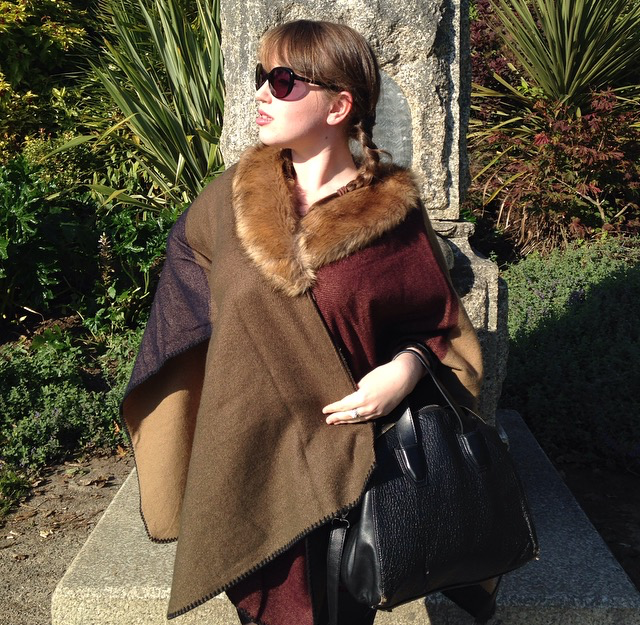 And for me, capes or blanket wraps are the perfect fashion must-have for these colder months. Not only have they been the favourite autumn/winter staple for the last few years, they seem to be the perfect finishing touch to a variety of outfits and styles. You can dress them down with jeans, jumper and boots for the day, and then use it as a stylish cover-up over a dress and heels for the night. Also what I love about capes is that, as somebody who runs quite warm throughout the year, I sometimes find winter jackets and hoodies restricting. I usually find myself ripping them off throughout the day when I get too hot, but their bulkiness makes them difficult to carry. So the brilliance of capes are that they can be easily tucked away in some moderate-sized handbag. Also, if you add a belt, you can transform this sometimes, shapeless design into a gorgeous waist-flaunting piece of fashion. And for all us curvy girls, who sometimes find the coat-over-chest size an issue, the cape is comfortable and wide enough to cover these areas without appearing too shapeless. And what I love about my particular cape is the fur collar. Because no matter when I wear it, I feel like a Russian princess! Now, this isn’t a typical young adult piece of fashion. This is high-end and with a matching high-price. But I have been blessed with this bag as a graduation present, and it definitely had to come in my Autumn Favourites. The Speedy 30, originally designed in the 1930s, has become a staple bag for wannabe handbag collectors, and usually one of the first pieces that they own. And I was no different. 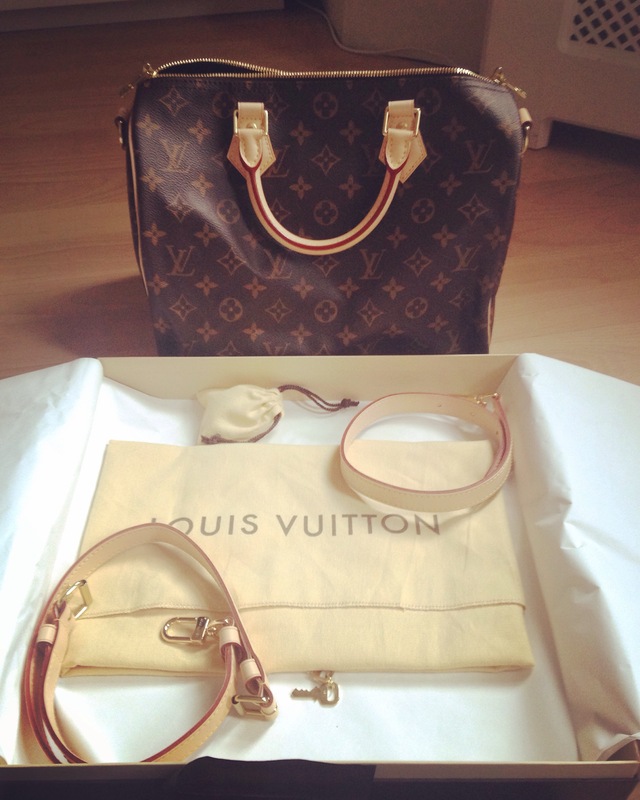 With the monogram canvas design, calfskin handles and beautiful design (honestly this bag can hold so much!) this bag can seamlessly move between day-to-night, and even as an overnight bag. Also, with the Bandouliere design, this comes with a strap that can be adjusted to be shoulder-carrying, or even cross-body, so for that added comfort and security. As well as being a fashion classic, this bag is perfect for autumn as it has a muted colour scheme that fits in well with the typical autumnal colours of browns, reds and purple, and it also is sturdy enough to survive being rained on, strong winds and probably even snow. I just love this bag. And there will be a proper blog post linked here. So, with winter coming, the shoes that I’m now veering towards are quite different from my summer flipflops and lacey flats. And recently, I’ve bought two pairs of shoes that have completely revolutionised my wardrobe. The first are these over-the-knee block boots from New Look. Now, as a girl who has been blessed with significantly musclear calves and thighs, I find buying boots on the high street a very difficult and limited task. Either they have to be built for people with wider calves – and these completely swamp my thinner ankles and make my boots sag – or I have to just go for ankle-length ones, which is completely fine, but isn’t what I want in a winter boot. But recently, after a random trip into my local New Look and having a peruse around the shoe department, I stumbled upon these boots that miraculously fit snugly over my calves without any zippers or stretchy panels, and even went up to my knees. These boots are faux-suede, and very cosy for these colder months. With the over-the-knee design, they offer that little more warmth and protection for your knees and lower thigh, as well as making you look a little like a super-hero. The block heel isn’t too high that it looks out of place for a regular boot, and they can easily be worn over jeans for a casual day look, or with tights for a dressier nighttime. And for £45, it isn’t too high a price. So I’d definitely recommend these boots! And for all those girls out there who don’t know whether they’ll fit, go in and try them on! I have worn mine to death, as they look and feel good, plus they fit over my calves and flatter my legs. So click here if you want to buy them. 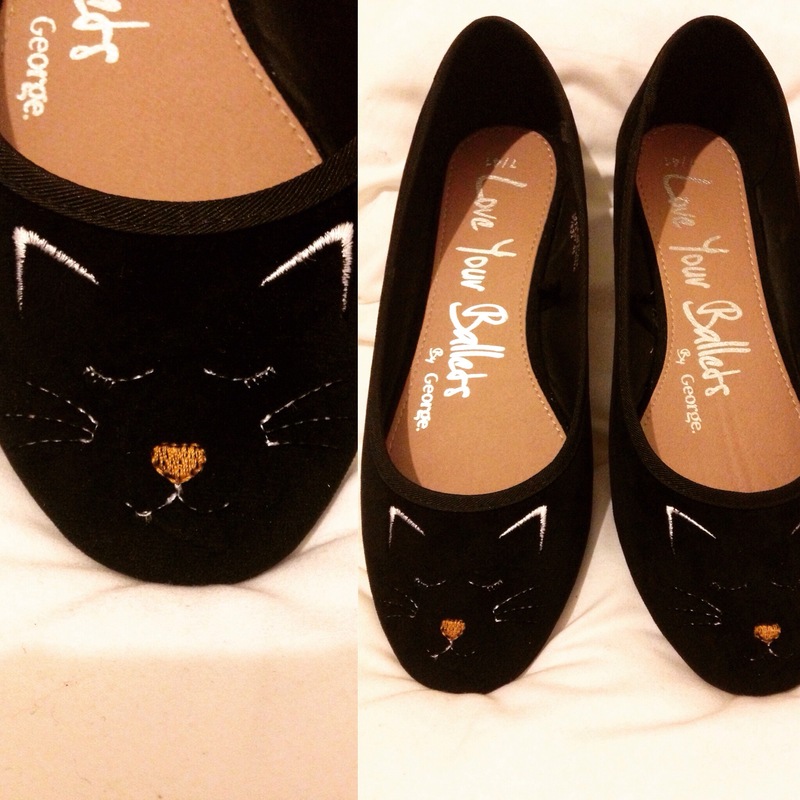 And the second pair of shoes I bought are these adorable cat-face ballet shoes. Now, I have lusted over the Charlotte Olympia Kitty flats for a long time, but at nearly £400, I just couldn’t afford them. But when I was flicking through a fashion magazine and stumbled upon this £8 supermarket alternative, I just knew I had to have them. Despite being labelled as a ‘slipper’, these are perfect for the crisp autumnal weather, and with a subtle cat face design, and a gorgeous velvet exterior, these shoes may not be suitable for wet days, but are an adorable alternative to the staple black-ballet pumps that should be in every girl’s wardrobe. And for £8? Absolute bargain. So, these are my go-to autumnal fashion favourites. Links to items will be listed below if they are available online, and if not, try in your local shops or through catalogues. But let me know in the comments if you have any autumnal fashion favourites!